Spirax Sarco introduces Steam Jet Thermocompressors. The high efficiency energy savings solution. Are you wasting potential energy by venting flash steam? 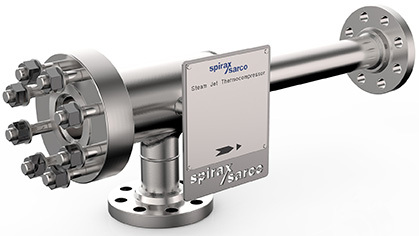 If so, Spirax Sarco’s Steam Jet Thermocompressor is an energy saving device that compresses low-pressure steam, often waste steam, to a higher acceptable pressure that can be recycled back into the process. Processing industries are constantly looking for opportunities to reduce energy costs by optimizing their energy consumption. Spirax Sarco is focused on helping these customers reduce waste steam to improve their steam generation efficiency and increase their profitability. This is where our Steam Jet Thermocompressor can benefit. Our Steam Jet Thermocompressor uses high pressure steam to entrain low pressure steam and discharges at a pressure that lies somewhere between the two pressures. High pressure motive steam enters and passes through the nozzle and enters the suction chamber where it is brought in contact with the low pressure steam. This steam mixture then enters the diffuser where its kinetic energy is converted to pressure energy. The steam discharged is then put back into the process. Each unit is available in many materials and is designed specifically to suit your process requirements to ensure maximum operating efficiency. All products comply with the demands of the Pressure Equipment Directive (PED) and are CE marked where appropriate. All of our design and manufacturing processes are quality assured and certified to BS EN 9001:2000. The product is manufactured to ASME B31.3 mechanical design code.